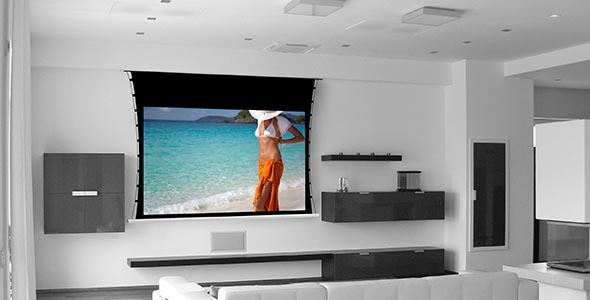 The launch of new high-quality projectors at a more competitive price, together with the fast growing availability of High-Definition programs, has pushed the demand for no compromise high-quality video projection screens at a much more affordable price than ever before. The “Classic Line by Screen Research” has been designed to target that market and bring a very competitive offer in that market segment. The product line offers, together with an easy-to-configure and fast-to-install options, a lot of advanced design features unmatched before at that price category: automatic adjustable tab-tensioning system, high precision black borders applied with high frequency welding; vibration proof and silent stop motors, crease-proof, fold-free rolling mechanism, fast-mount constant Elastic tensioning system for fixed frames are just examples of the attention to detail and quality that is brought to this product line. The products are using only ISF certified SolidPix screen surface for superior image fidelity and accuracy. The products are manufactured in Europe in the new Screen Research / AdeoScreen modern plant: ambient temperature control, CAD and PAO automated design and manufacturing, guarantee the perfect quality and accuracy on the products delivered to the customers. The "Classic Line by Screen Research" is available through the worldwide Screen Research distribution network.